I’ve noticed that recently I have been really sensitive to lighting and moods and not just to specific subjects. It’s problematic for me, because it is so difficult to figure out how to capture a feeling. That is part of what was going through my head when I took this photo early in the morning this past Wednesday at Occoquan Bay National Wildlife Refuge. The sun had already risen, but it was still low in the sky. I loved the way that shafts of light were visible coming through the trees. 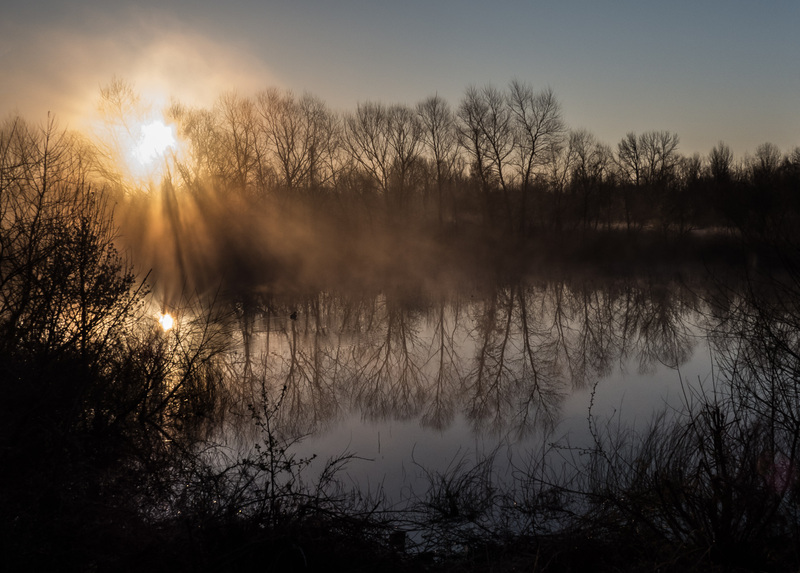 It was a cold morning and mist was hanging over the still water of a small pond. Could I possiblycapture the details that took my breath away? So what do you think, or more importantly, what do you feel? Ospreys (Pandion haliaetus) in my area have been building nests in all kinds of places, including on some channel markers in the Potomac River off of Occoquan Bay National Wildlife Refuge. I personally don’t really think that there is enough space there for a nest, but the ospreys seem to think otherwise. 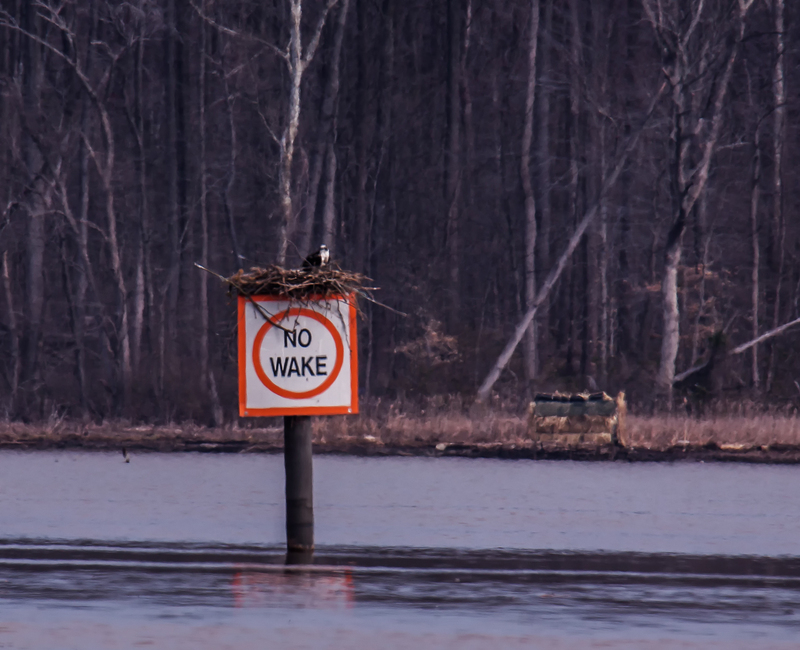 I am amused by the “No wake” sign that they have chosen. During busy periods, I would think that “No sleep” would be more appropriate. 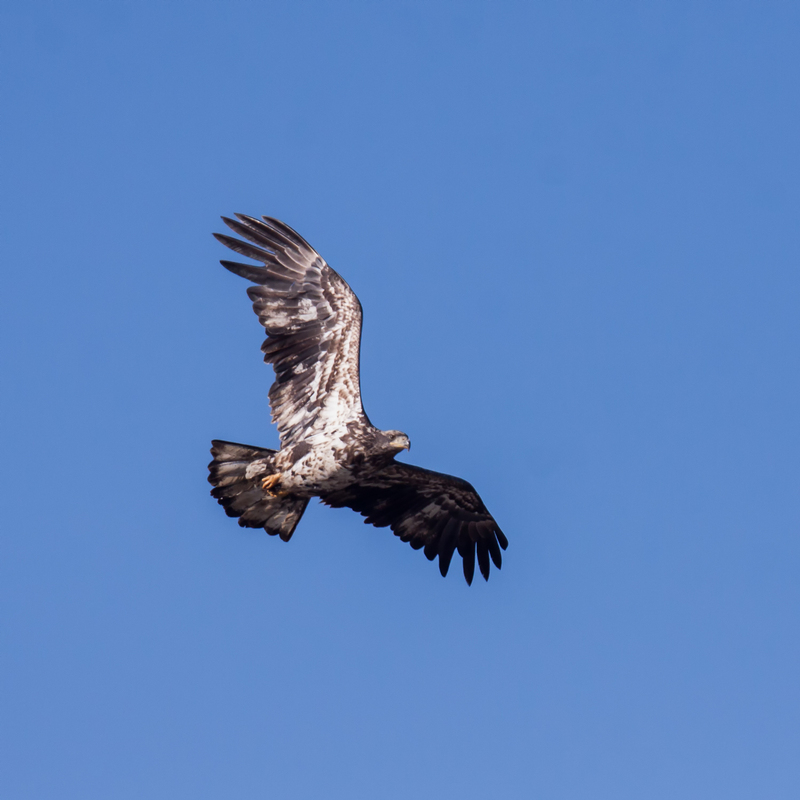 There is no doubt that I love photographing majestic raptors, like the bald eagles that I regularly feature. Yet there is something equally special about capturing images of tiny songbirds, like this perky little Blue-gray Gnatcatcher (Polioptila caerulea) that I spotted earlier this week at Occoquan Bay National Wildlife Refuge. How small are these birds? According to the Cornell Lab of Ornithology, Blue-gray Gnatcatchers are 3.9-4.3 inches in length (10-11 cm) and weigh 0.2-0.3 ounces (5-9 grams), just slightly larger than a hummingbird. 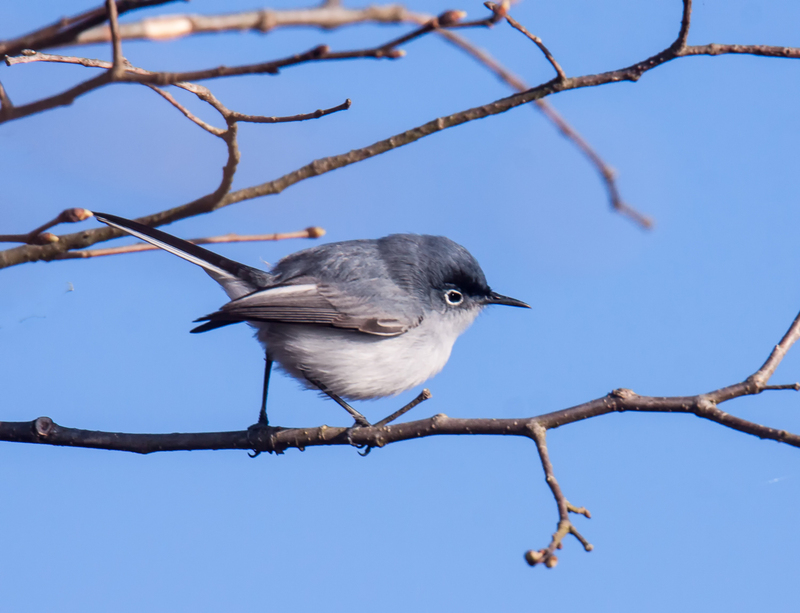 The same source notes that, despite the bird’s name, gnats do not form a significant part of a Blue-gray Gnatcatcher’s diet. 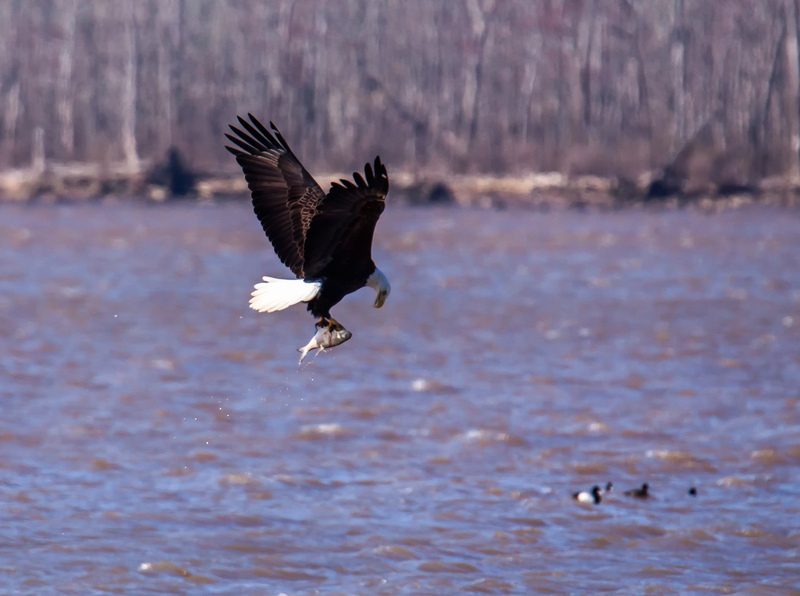 A Bald Eagle (Haliaeetus leucocephalus) paused for a moment to check on its catch as it flew away on Monday at Occoquan Bay National Wildlife Refuge. Occasionally I will see an eagle flying with a fish in its talons, but it is quite rare for me to see an eagle actually catch the fish. 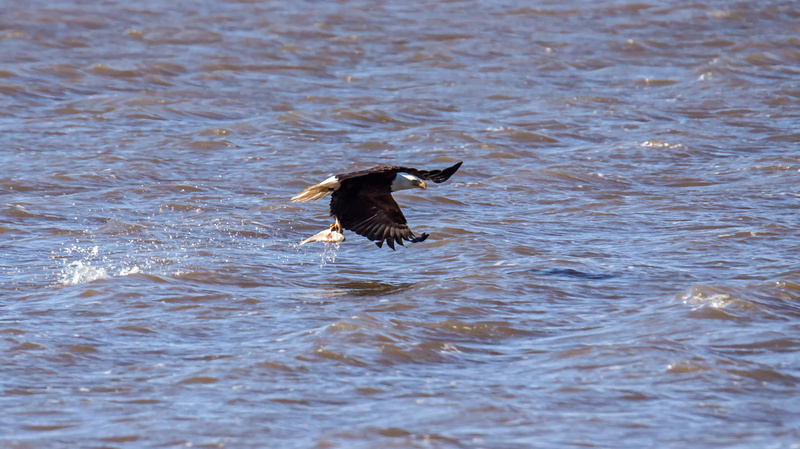 In this case, I was fortunate enough to spot an eagle circling low over the water and I captured a few images just after the eagle snagged the fish. In the second shot, which chronologically speaking was the first shot, you can just make out the fish. In the third shot, the eagle appears to be adjusting itself to the additional weight and is starting to increase its speed and altitude. These are the kind of action shots that I love to capture. I never know when such situations will arise, so I always try to remain ready to react. On Monday it was cool and windy and I didn’t expect to see many birds at Occoquan Bay National Wildlife Refuge. 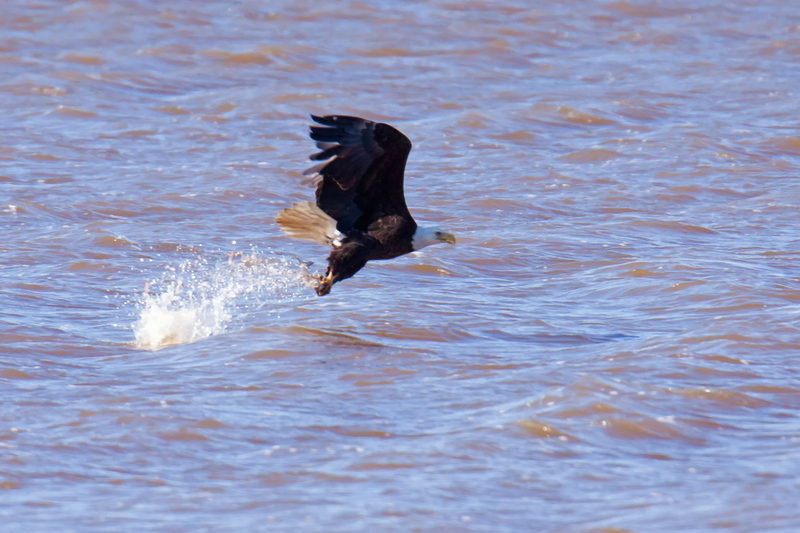 I was pleasantly surprised to spot several Bald Eagles (Haliaeetus leucocephalus) flying about. The wind seemed to slow them down a little and gave me a slightly better chance of capturing images of them in flight. 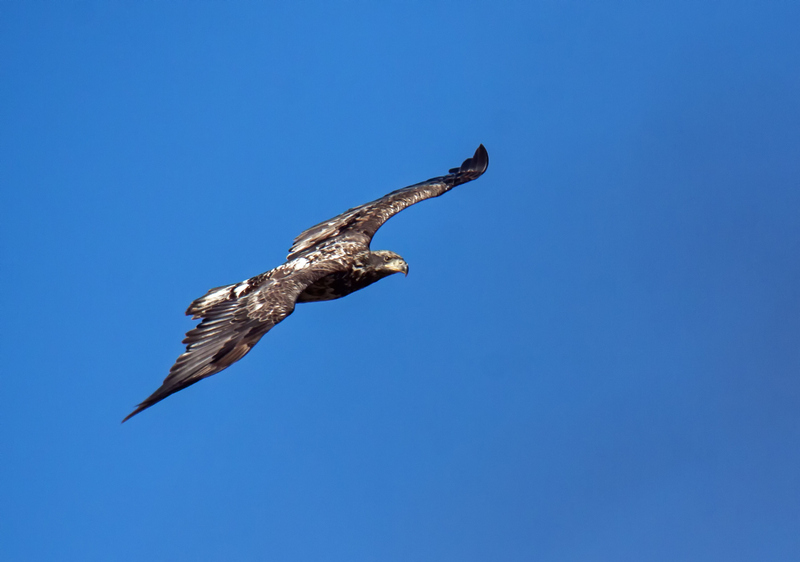 My favorite subject was this juvenile eagle. Sometimes juveniles can look somewhat bedraggled with their multi-colored feathers, but I thought that this one looked quite handsome, especially when the light hit it from a good angle and illuminated its body. One unexpected benefit was that it was easier to get a proper exposure with the juvenile because it does not have the extreme contrasts of the dark body and white head of the adults. 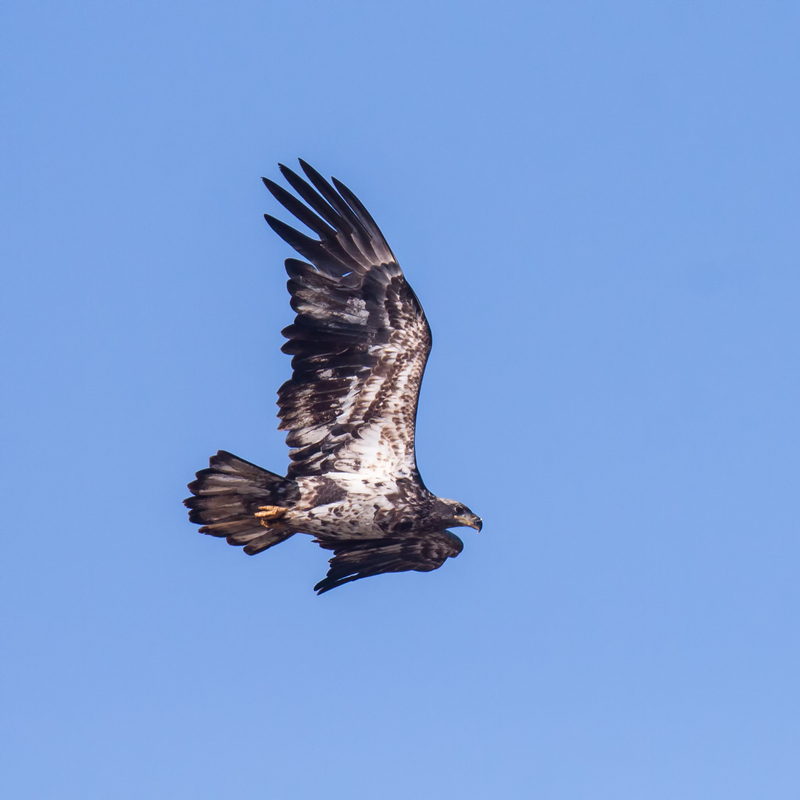 In many of my shots of adult eagles, the body ends up underexposed and/or the head ends up overexposed. 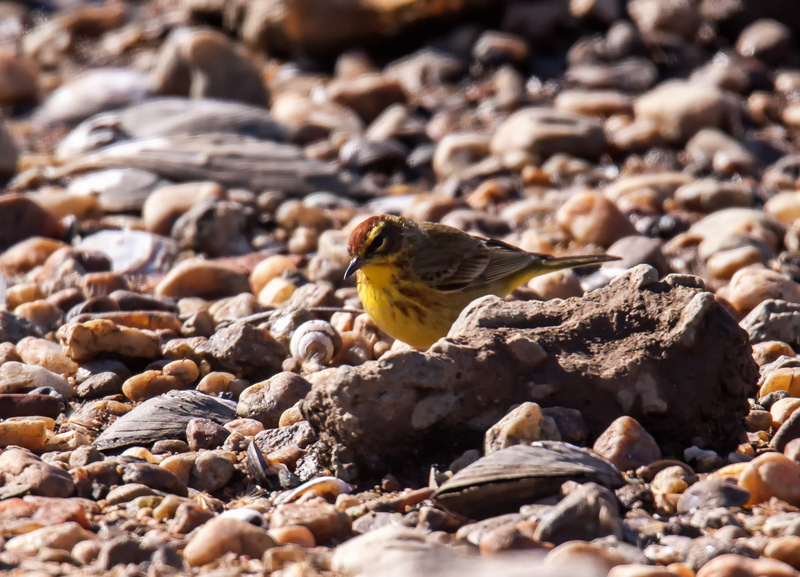 Yesterday at Occoquan Bay National Wildlife Refuge I spotted my first warbler of the spring, a Palm Warbler (Setophaga palmarum). For several weeks, I have been diligently searching the ground and the trees for warblers, whose appearance marks the beginning of spring for some birders. 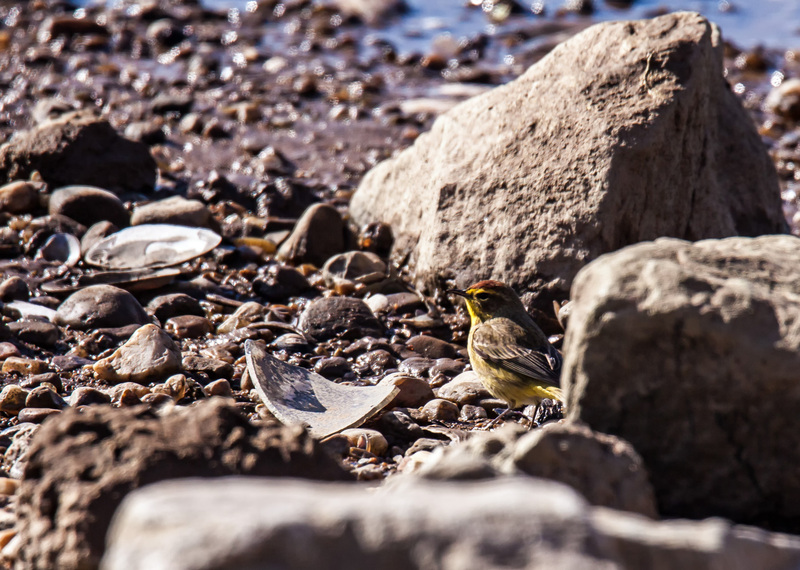 It was not surprising that the first one I saw was a Palm Warbler, because they are traditionally one of the earliest species to arrive, but I was a little surprised to find several of them at water’s edge, poking about in the rocks and the debris. In the past, I have most often spotted them on the grassy trails. I was not able to get close to these little warblers, so my normal temptation was to crop my images, as I did in the first one, in order to highlight the bird. As I was working on the second image, I decided I liked the idea of including more of the environment, even though it is a bit cluttered. What do you think? Some birds are so round in appearance that they look more like cartoons than real birds. 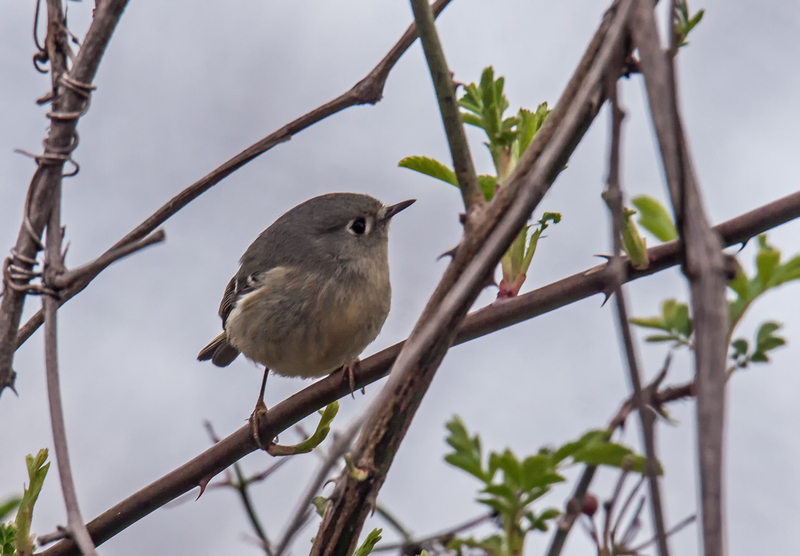 That was certainly the case with this tiny Ruby-crowned Kinglet (Regulus calendula) that I spotted last week at Occoquan Bay National Wildlife Refuge.